This year, the Jewish festival of Passover – April 10 to 18 – coincides with the Christian celebration of Easter. And Easter, somewhat unusually, falls on April 16 in both the Orthodox and Western calendars. Both Passover and Easter are based on biblical accounts. Passover commemorates the Israelites’ Exodus from Egypt, as described in the Hebrew Scriptures. Easter marks the resurrection of Jesus, as described in the Christian Gospels. In this important season for both traditions, here are five key facts about Americans and their holy texts. 1 About a third of Americans (35%) say they read scripture at least once a week, while 45% seldom or never read scripture, according to 2014 data from our Religious Landscape Study. 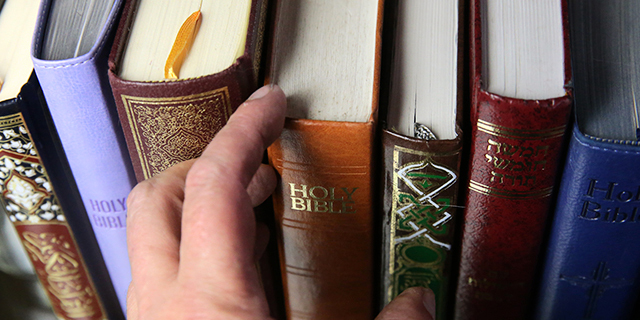 Frequency of reading scripture differs widely among religious groups. 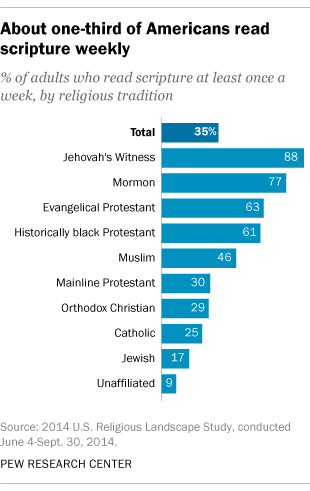 Majorities of Jehovah’s Witnesses (88%), Mormons (77%), evangelical Protestants (63%) and members of historically black Protestant churches (61%) say they read scripture at least once a week. By contrast, 65% of Jews say they seldom or never read scripture. Regarding other religious texts, four-in-ten Americans knew that Jesus appeared to followers in the Americas according to the Book of Mormon, and 54% correctly name the Quran as the holy book of Islam.